Who among the current young crop of coaches will, in 10 or 20 years or so, take his place among this group of coaching immortals? Jon Gruden? Just two years ago, he was a genius. Brian Billick? Bill Belichick? Maybe. Maybe. Maybe. 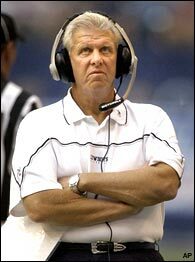 Bill Parcells' latest project? The Dallas Cowboys. The Tuna's a turnaround artist with two Super Bowl wins and another Super Bowl appearance to his credit. He's got a solid (but not spectacular) 159-113-1 overall record (not counting 2004). He's a rebuilder and a motivator, in an era when both are more difficult to accomplish than ever. In his 12 seasons as had coach of the Rams and Redskins, Allen never had a losing season. Seven times his teams made the playoffs. Twice he led the Rams to division titles. And he took the 1972 Skins all he way to Super Bowl VII, when Mr. Shula & Co. got in the way of his best shot at an NFL championship. Twice Allen was named NFL Coach of the Year. Allen finished his coaching career in 1977 with a lifetime regular-season record of 116-47-5, but had a disappointing 2-5 postseason record. Madden is truly one of a kind: a great head coach who changed careers and then became a great announcer. If you only know him as the bus-riding, hardware-hawking Telestrator thaumaturge, dig this: in his 10 years at the helm of the Raiders (1969-78) Oakland racked up 112 wins, 39 losses, and seven ties in the regular season and postseason. That comes out to a .731 winning percentage, second only to Vince Lombardi.